A University of Central Florida researcher who is using laser pulses to create more powerful electronics, and a professor who is looking to combine thousands of transistors into a single computer chip have earned $840,000 in grants from the Air Force Office of Scientific Research. Michael Chini, an assistant physics professor, and Sumit Jha, an assistant computer science professor, earned two of 56 Young Investigator Research Program awards for 2016. Chini is researching the use of ultrashort pulses to measure and control electron motion in solid materials, which could aid in the development of high-speed electronics. These electronics could lead to better remote sensing equipment and the capability to send more encrypted information faster than currently possible. The Air Force is also interested in understanding how materials respond to extreme environments and radiation, with a goal of designing new materials with specific electronic and optical properties, Chini said. 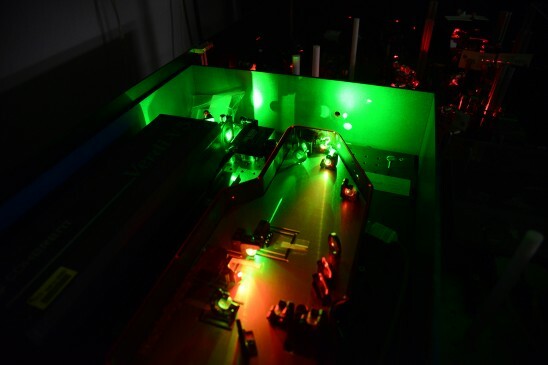 “We hope to use broad-bandwidth laser light to achieve some of the fastest speeds in electronics,” said Chini, who earned his Ph.D. in physics at UCF and joined the faculty in 2015. He will receive $480,000 for his project. Jha’s project pushes the boundaries of the evolving world of computer science. “Our project will couple human ingenuity and machine intelligence with inspiration from theoretical neuroscience to explore new designs of computing systems that can be built using novel devices,” Jha said. Computing systems today are built on old technology and the fundamental passive circuit elements that people studied in high school – resistors, capacitors and inductors. In the past eight years, material scientists and device engineers have fabricated a fundamentally new kind of passive circuit element called the ‘memristor.’ Since the device is new, it hasn’t become obvious how it can be best used to perform computations. That’s where Jha’s work begins. Because technology is developing so quickly, the Air Force and industry are interested in blending what has been learned about the wiring of the brain to see if engineering can build devices that are not only faster, but have more applications. One approach is to integrate circuits by combining thousands of transistors into a single computer chip, which is the focus of Jha’s project. Jha, who received his Ph.D. in computer science from Carnegie Mellon University and joined UCF in 2010, will receive $360,000 for his research. Overall, the Air Force announced approximately $20.6 million in grants to researchers at 41 research institutions and small businesses. The program is open to scientists and engineers at research institutions across the United States who received Ph.D. or equivalent degrees in the past five years and who show exceptional ability and promise for conducting research. The Office of Scientific Research received more than 265 proposals for grants. Those selected will receive the grants over a three- or four-year period. For details on the research program, contact afosryip@us.af.mil.